Lynn Palm’s session was called “Be Positive: Your Horse Knows Every Word You’re Thinking.” She focused on showing the results of keeping our thoughts on a positive path. “Positive” in this context doesn’t mean unfounded optimism. 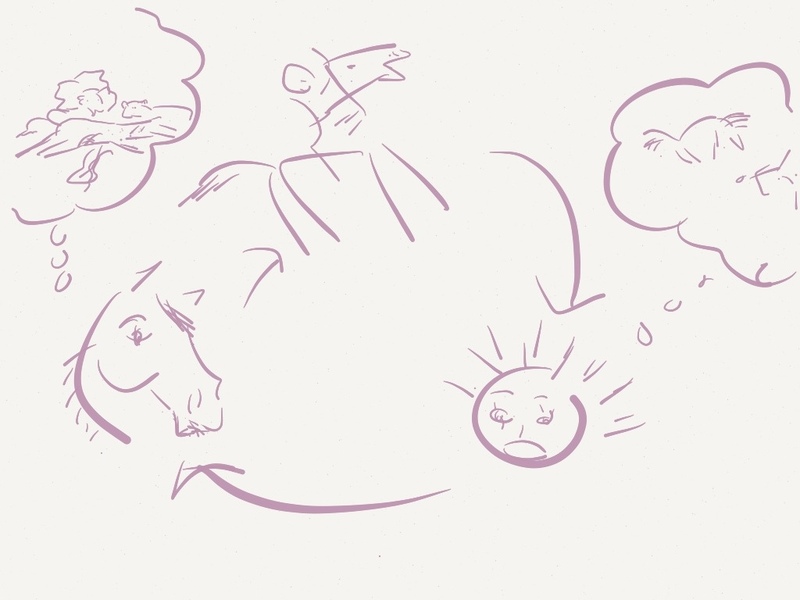 It means phrasing our thoughts around the outcome we want (“we will trot evenly around this circle”) instead of what we don’t want (“oh god what is my horse going to do next, she’s so spooky, ack, she might shy at that, ack!”). In Parelli lingo, this is “the natural power of focus,” and it goes much deeper than just “what we want.” Whatever has our complete focus is what will happen. There is no other outcome. It will happen, because it is the only thing than can happen. If you can focus 100 percent on “we will trot evenly around this circle, with rhythm and relaxation and contact,” that is what will happen. Your horse can then share your bedrock certainty. Ah! yes! we will trot evenly around this circle! those billowing tarps and flapping flags and whipping branches and swirling dust devils are not the droids I’m looking for! If you focus 10 percent on that and 90 percent on possible spooks, distractions, and disasters, you are going to get spooks and distractions, and possibly a disaster. In fact, just now, it hit me how rare the disasters actually are, relatively speaking; it tells you something about the horse-human bond that horses manage to stay disaster-free most of the time, even in our fear and lack of focus. Lynn said that when we catch ourselves looking at our horse, or thinking “why is he doing this, what will he do next,” that’s a sign that we need to relax, slow down, think about something else, be casual, breathe, and ride through it. She didn’t mean ride through an explosion. What she described sounds awfully close to Linda’s teachings on handling thresholds. Like Chris Cox in his session about rider confidence, Lynn coached her student on physical balance. Breathing — “in sets, inhale and exhale” — and relaxing were key. Even just that made a change in the horse. At first, the student had her hands wide, below the crest of the neck. Her arms were stiff — her whole body looked rigid — and any time the horse even hinted at shying, raising her head, moving sideways, or some other “unexpected” move, the rider clenched tighter and jerked on the reins. The horse expressed her own discomfort through tense, jerky motions, and by flicking her tongue all around. Even when she kept her feet relatively still, her tongue was in motion, sticking out of the side of her mouth, rolling the bit, flapping up and down. I watched the horse and rider escalate in a cycle of nervousness and thought ah, yes, I remember that. Many of my normal lessons went just that way. The first change Lynn suggested was for the rider to raise her hands and move them forward. With the rider’s hands in front of the horn and above the mane, she could not lean on the reins to balance. She also coached the rider through looking ahead, not down, and had her tie the reins in a knot without looking at them and drop them over the horn. While an assistant managed the horse on a longe line, the rider practiced raising her arms, then making a T, then resting her hands on her thighs, then picking up the reins without looking at them, then setting the reins down again. All while looking where she wanted to go. When the rider let go of the reins and began to do other things with her arms, finding her balance point, the mare reduced the tongue action considerably. The longer the rider stayed off the reins, the more relaxed the mare’s entire body became, and the less we saw the tongue. Parelli reminds us that the more we use the reins, the less they use their brains. I can’t help but think that many people prefer that their horses not use their brains, because the people do not trust their horses. They feel safer on horses that give up trying to use their brains and go dully where the reins drag them instead. These riders feel safer or smug with the illusion of control because they don’t realize it is an illusion. 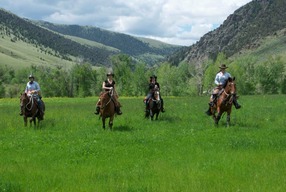 In Lynn’s session, the looser the reins, the more relaxed the horse, which calmed the rider, which calmed the horse. I ride Rocky now with the understanding that he will communicate with me in phases, not “suddenly for no reason at all” transmogrify into a bronco. It took me a lot of ground time to develop that trust. Our horses are our mirrors. They are quick to feel a change in us, to provide release for us, and to reward our slightest try. We just have to learn to do the same for them. Regina, would you say Lynn Palm follows “natural horsemanship” methods? s00z, I haven’t seen enough of her to assess that. On the plus side, I didn’t see anything that made me go “ack! no! that’s not following natural horsemanship principles!” though. Here are some of my thoughts based on the 45 minutes I did see. Lynn Palm’s bio says that she’s been teaching “horsemanship” longer than any of the other “top clinicians.” It comes across as defensive, and my impression is that she would reject the phrase “natural horsemanship” because it has been used, overused, and mis-used so much in marketing. She didn’t say that — that was just my impression. I also suspect that she might even be exasperated at all the fuss about “natural horsemanship” and the people who have built big brands around it. I didn’t see enough to judge whether she has a teaching/program methodology based on natural principles and the different learning styles of adult humans. Also, the two horses I saw her work with were showing similar behaviors and both were nervous/fearful, so she was able to use similar methods and exercises for both of them, which means I didn’t see if she adjusts by individual horse personality or general temperament. I would assume that she does, based on her explanations of the horses’ signals and what the riders could do to help the horses become more confident. She did not misread fear as dominance, for example. She did not break down the horse behavior as basically as Linda does for newbies(and might have done that on purpose due to limited time), but she did describe it and she did explain how to understand it from the horse’s point of view and then what we can do about it. I didn’t see her work directly with a horse; her session was about helping the rider calm and relax and showing how the horse would follow suit. She also had organized her material into a sort of “10 tips” structure which was good, especially when on a limited time and not able to interact directly with hundreds of spectators to know what they most need to know. I personally learn well from the Parelli method because they have developed a specific vocabulary and follow universal instructional design/information architecture methods that hits all the areas of learning — aural, visual, textual, experiential, etc. I don’t know if Lynn’s DVDs do this as well. I also have a good student-teacher rapport with Linda Parelli (from the DVDs I mean; I’ve talked to her in person only a few times but I mean here as a remote instructor) and enjoy Pat’s showmanship and the beauty of his connection with horses. One thing that put me off somewhat, personality-wise, was how Lynn reacted when she was politely reminded by the next group that her time was about up. (Note that I don’t have any knowledge of any history or previous interaction or whether she had a migraine or any other mitigating factor, but this is my take on what happened and it fit with a few other things I noticed during the session.) She got defensive and took the stance that because her session had started late due to the previous demo running over, she was going to take her full allotted hour and the next group just had to wait. The person reminding her of the time was polite and professional and had waited until it was a good time for the horse to stop — the horse had just accomplished something huge (cantering, relaxed and responsive, through a squeeze) and it would not have hurt to stop the session there. I felt like Lynn had an opportunity to get the arena schedule back on track and end her session on a high note and instead felt entitled to “her whole time.” I don’t know if she felt she was protecting her student and audience by not letting her session be “cut short,” or if it was just automatic on her part about “deserving” the time she was given. Either way, that’s too narrow of a focus for my preferences. From my point of view, she put her “slated time” above the expo schedule, the students/horses in her session, and the spectators. The rider was exhausted and elated at the canter, the horse was in a good place stop, and the spectators might also have wanted to get to a session in another arena plus new spectators were showing up to watch the next demo. I did wonder if Lynn didn’t see the horse doing the canter accomplishment because she was focused on the conversation about time. Both she and the other woman were on the PA system so we all heard the exchange.